Mary is the heart and soul of the dance sessions at the hospital. There is dance in every cell of her body: as she moves her eyes twinkle and a little dimple in her right cheek appears and disappears with her endearing smile. Between dancing, she tells stories that go back generations which are at once humorous and delightfully shocking! Today Mary arrives later than the other participants. We pause to welcome her: she has been on the ward for 3 months so is a familiar face to many, but nevertheless, welcoming each person to the session where we are a community of people and not patients or staff, is paramount. Mary rests back in her chair, her legs, which have little movement, are out stretched so her feet, encased in red woolly socks, do not touch the floor – she has not held her weight fully on the ground for many years. I notice her hands begin to dance, an elbow extends, a lift of her arm - but then dropped with a heavy sigh. No dance in her eyes or smile this Monday morning. No stories leading to raucous laughter from the group. And her legs do not gently rock as they can in response to the motion from her upper body, but just lie with a heavy weighted stillness, which seems to have crept into her whole being. The softness and flow of movement that I know lives within Mary’s body is not there today. Later I asked Mary how she was feeling: “not so good this morning.” “I know” I replied. She began to cry. I moved to her side and rested my hand on hers. We sat together, side by side and slowly I let my hand soften around hers. As we sat, Mary with eyes now closed, I found myself leafing through my years of training and experiences to see where I could support her stillness, find the dance in her stillness. It lay in the connection of our hands, skin, and all that lies beneath the surface of the skin: water, blood, cells, pulse, breath. A little lift of her fingers and I replied with a lift of mine, a stretch of hers a stretch of mine, a fold of hers and I envelope mine around. Mary rotates her hand so her palm is now facing upwards and mine is underneath. She turns to look at me, her eyes are lighter, a twinkle. I guide her hand up and there we are reaching high guiding each other with a light touch, pausing when we do, moving when we do. In the hospital Mary is ‘immobile’; in the dance sessions, she is still. Paradoxically, stillness is the starting point of all movement. An interest I have in these hospital sessions is in exploring how ‘being still’ can shift from a state of boredom, lethargy, or sadness to being the start of something else where the body is allowed to unfold if it wishes to, and stillness is given a sense of respect. It has been said that stillness is the art of movement, but maybe stillness is the secret of movement. In dance, sitting with stillness I find opens space to listen to my body and in turn - in this story - to Mary’s body and the quiet dances within. There may have been chaos within Mary, upset or hurt that Monday. I do not know; I am not there to know but to be where she is and, if moving seems right, we will move, if not, we will find the gentle movement that lies within stillness. Mary’s dance today may have been a fleeting light on an otherwise grey morning, or not. But it was a small journey from a still point where a connection was made and where words were not needed, but by listening a meeting point was found. Terry Hall’s dementia means that he no longer enjoys his old hobbies of reading and fell walking. However he has found a new lease of life by discovering the therapeutic effects of dance. The retired post room worker, aged 71, attends weekly dance sessions at the Theatre by the Lake in Keswick as part of the dementia project, Dancing Recall. Jean, his wife, says, ‘Terry has had Alzheimer’s for four years and can’t really do many things now but this group is something we can both enjoy together. Although Terry doesn’t remember the sessions afterwards they can still do him a lot of good. 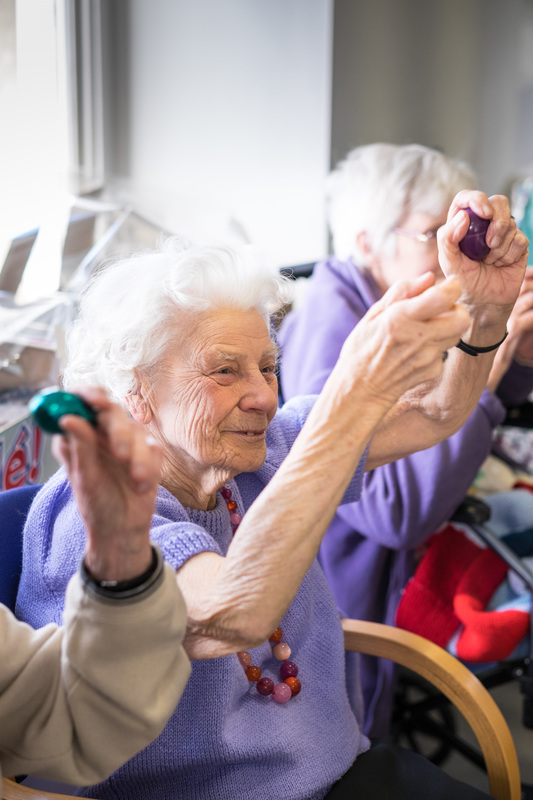 Apart from the enjoyment of the moment, exercise can improve wellbeing and mobility for people with dementia, along with the ability to carry out daily activities, concentration and responsiveness. Dancing Recall was set up by Daphne Cushnie, a specialist physiotherapist and community dance practitioner, 18 months ago. A release of funding through England’s National Dementia Strategy and a ‘more compassionate and person-centred approach to care’ generated an opportunity for Daphne to create Dancing Recall. A six-month pilot project began in September 2013 in six areas of Cumbria, involving eight weekly dance sessions for people with dementia and carers in local community and leisure centres. Additional funding meant the project could start again in the Eden and Allerdale areas of Cumbria last October, running over two years. Daphne says her clinical background gives her a particular understanding of dementia. Community dance practitioner Susie Tate, who helps run the programme, says the sessions have multiple benefits for people who range in age from 50 to dancers in their 90s. Susie says participants really enjoy singing along to the music and she says the effects often last far longer than the end of the session. ‘Catch a falling star, by Perry Como, is always a particular hit,’ says Susie. ‘And one care home worker told us that after a couple of residents danced to it at one of our sessions, the next time they heard it on the radio they leapt up and starting dancing away so it certainly had an effect on them. Mary Elliott, House Manager of Theatre by the Lake, says she was so impressed by Daphne and Susie’s work that she offered the venue for free. Daphne says the project’s benefits have been more than she could have hoped for. ‘Music has an amazing effect on the organising capacity of the brain. When you bring music and movement together in an environment which is rich and full of theatre the results are extraordinary,’ she says. A programme in Cumbria called Dancing Recall is bringing people with dementia together to enjoy regular dance sessions, with many benefits for their health and wellbeing. Daphne Cushnie, a neurological physiotherapist and community dance practitioner, set up Dancing Recall to provide enjoyment and exercise for people with dementia. Jean Hall, whose husband Terry has Alzheimer’s, says they both love the friendly, relaxed atmosphere. Susie Tate, who helps run the programme, says the sessions have multiple benefits that can last well after they have finished. Daphne says that the combination of music and movement in a rich environment has extraordinary results for the people who take part. Daphne Cushnie (front left) with Dancing Recall participants. Let’s all sit down, take a collective deep breath and look carefully at these recent figures from the Alzheimer’s Society. 800,000 people in the UK are currently living with dementia. 670,000 people in the UK are caring for those with dementia. And what about this figure – by 2021 over a million people in the UK will be diagnosed with dementia. Just imagine the implications of this on a personal and collective level. Dementia is a progressive, remorseless decline in cognition, function and behaviour. The collateral impact is also vast. Carer burden in terms of physical work, psychological distress and financial obligations is huge. The cost to the state is vast too. We don’t need to imagine the financial implications because another statistic tells us that the estimated healthcare cost to the UK in 2021 tops £23 billion! My work, though I should add that it is also my passion, straddles two worlds: neurophysiotherapy and community dance. For many years I have argued the case for the effectiveness of dance and movement in the treatment of neurodegenerative disorders. In comparison to pharmaceutical or surgical treatments it’s cheap, it’s non-invasive, has only positive side effects and tackles many of the problems of social isolation as well as the clinical symptoms. It’s a message which has been slowly gaining ground. There have been huge strides in the field of dance for Parkinson’s, especially since the founding of Dance for Parkinson’s Network UK. But dance for dementia has lagged behind despite beacons of light from people like Dr Richard Coaten working with the South West Yorkshire National Health Service (NHS) Trust. In a recent article in the Guardian (Thursday 11 April 2013) Halima Khan, Director of People Powered Health said, “the NHS is... still finding its way towards a model that effectively manages long term conditions.” She argues for a person-centred approach that includes exercise and that, by her estimate, could save the NHS up to £4.4 billion a year. She also highlights the challenge of nurturing compassion in large, formal institutions where staff are under considerable financial pressure. There are many misunderstandings about what dance is, and what its potential may be to make a positive, measurable difference to the lives of those living daily with lifelong conditions that will almost certainly get worse. So, I was delighted recently to be invited by Active Cumbria to help develop Dancing Recall: Making Connections – a dance for dementia pilot project, which aims to bring a clinical perspective to the practice of community dance. The programme is delivered as a series of training days for dance practitioners followed up by mentoring sessions observing and supporting them in action as they team-teach. The model is founded on the values of community dance where relationship, creativity and community building are key, but brings in a logical structure based on clinical understanding. or out, glance, wave, stand, reach out, grasp another’s hand and drop it again. We take into account what is involved when we turn, clap high, stamp a foot and hold our balance. All of these seemingly simple movements are in fact highly complex. The interactions of the network of nerves and muscles is highly nuanced and when all works smoothly in a well-orchestrated nervous system we can take this facility for granted. But, when the signals become muddled and muted as they do in the various forms of dementia the effects on mind and body are profound and widespread. Our inbuilt ability to process information and respond verbally and through movement can be incrementally compromised. It is hard to think of an area of life which is left untouched by dementia as it progresses. the level of enjoyment, creative expression and full-hearted response we see at each and every session. So, here in the workshop dancing, singing, music and laughter are filling the room and animating faces every week as the first phase of Dancing Recall takes place. The participants arrive as ‘people with dementia’ but soon become simply people again as the dance begins. Peter has no knowledge of the model we are using, the clinical effect we are seeking or even the circumstances which have brought him to this dance studio in Kendal. He just lights up when he hears the music and is moved, from whatever ‘within’ means, to respond in his own way to its invitation. who accompanies her each week to dance. But she is full of grace and gentle gesture and her smile warms the assembled group. Flora has a natural flow and harmony of movement which makes her so expressive. Neurologists sometimes use the term ‘kinetic melody’ to describe the fluidity of human movement. Flora oozes her own special kind of kinetic melody. Mike wishes Flora was her old self, but can see her blossoming before his eyes as she tilts her head and smiles, or lifts a graceful hand, or waltzes across the floor with him. People with various different manifestations and stages of dementia have attended our groups. Some have the stiffening, fixing and flexing of the body which makes movement so impoverished and unreliable. But, even they soften in the dance. So here I am with both my hats on. The neurophysiotherapist and the dancer. What works in practice? What doesn’t? What do we need to do more of and what do we need to stop doing? I believe we should do whatthe latest National Institute for Clinical Excellence (NICE) guidelines suggest. We should converge social and medical streams of healthcare, listen to what real people have to say about what types of healthcare they find most useful, and offer community dance for neurodegenerative conditions as one option. involved in the running of this project. This network continues to evolve and will serve us well as we move ahead into the evaluation phase. Our evaluation processes are inevitably complex looking at both the training and the delivery. We have a considerable body of information to look at and use to help shape the future of this work. I have had a vision for many years that community dance for people living with neurodegenerative conditions would be made available within the NHS. Dancing Recall, coming at a time when there is national recognition of the scale of the problem, brings us closer to that vision. And the only way that vision will become reality is if it is shared; if together we act positively, decisively and collectively. Exercise did little for patients' moods, the research concluded. But it did help them carry out daily activities such as rising from a chair, and boosted their cognitive skills. Dr Laura Phipps of Alzheimer's Research UKWhether these benefits improve quality of life is still unclear, but the study authors say the findings are reason for optimism. Dementia affects some 800,000 people in the UK. And the number of people with the condition is steadily increasing because people are living longer. It is estimated that by 2021, the number of people with dementia in the UK will have increased to around one million. With no cure, ways to improve the lives of those living with the condition are vital. Researcher Dorothy Forbes, of the University of Alberta, and colleagues who carried out the Cochrane review, said: "Clearly, further research is needed to be able to develop best practice guidelines to enable healthcare providers to advise people with dementia living at home or in institutions. "We also need to understand what level and intensity of exercise is beneficial for someone with dementia." Dr Laura Phipps of Alzheimer's Research UK said: "We do know that exercise is an important part of keeping healthy, and though we can't say that exercise will prevent dementia, evidence does suggest it can help reduce the risk of the condition as part of a healthy lifestyle." Exercise - gentle walking, a moderate gym session or even dancing and a sing-song - can help people cope with the devastating impact of dementia, researchers believe. Gentle walking, a moderate gym session or even dancing and a sing-song - can help people cope with the devastating impact of dementia, researchers believe. A group of four men - all living with dementia, but still relatively fit and able - are very gently put through their paces by Peter Black, one of the staff at the residential home. The equipment in the room has been specially designed by the company Technogym so it is suitable for people with dementia, most of whom are quite elderly. So there are no great weights - just some gentle lifting and pushing, with the machines based on a hydraulic system rather like a bicycle pump. "It's not so much to do with being physical and using muscles, it's all to do with stimulation, says Peter. "At the end of the exercise people don't go away with aching muscles, they go away laughing, joking, looking at each other - and feeling a lot more confidence in themselves." Peter says it is all too easy for people with dementia to become withdrawn, but the exercise classes help to bring them out of themselves. David Dyer is still a physically imposing man. The tattoos on his forearms are a reminder of his time in the Army and prison service. Now a resident at Redholme, like many people with dementia he has at times become confused and agitated - even aggressive - with staff. But the gym sessions seem to help calm him and have become an enjoyable part of his routine, he says, in moderation. "It's a good method for strengthening different muscles and you can just keep until you reach the stage where you say, well, I've had enough." And, I ask, it helps keep you in shape? "It certainly does, yeah. But you wouldn't want to be doing every day, like!" Redholme has been using the gym equipment for the past two years. It is only suitable for people in what might be called the middle phase of the condition, before their physical impairment becomes too great. But over that time the home's owner, Anne McCann, has seen a big difference in the strength and stability of the people in her care, both physically and mentally. "We've had a reduced number of falls and we find if people are falling that they're not falling and breaking limbs - they'll put their hands out, they'll save themselves, they'll know how to fall - not only for the men but for the ladies as well. "We've had reduced medication, we've had lots of people taken off anti-psychotic medication from using the equipment and we find the sense of well-being all round is an enhancement." David Lowery, a research psychologist at the Central and North West London NHS Foundation Trust, is assessing the impact of mild exercise on the behavioural and psychological symptoms of dementia as part of a study funded by the National Institute for Health Research. "Some of the theories are surrounding the regulation of the sleep-wake cycle, and things around stress, and perhaps blood flow to the brain," he says. "Stimulation itself could perhaps prevent the brain from degenerating, which is one of the key things with dementia."